British Beatles Fan Club: "EPSTEIN" OFFICIALLY OPENS IN LONDON’S WEST END! 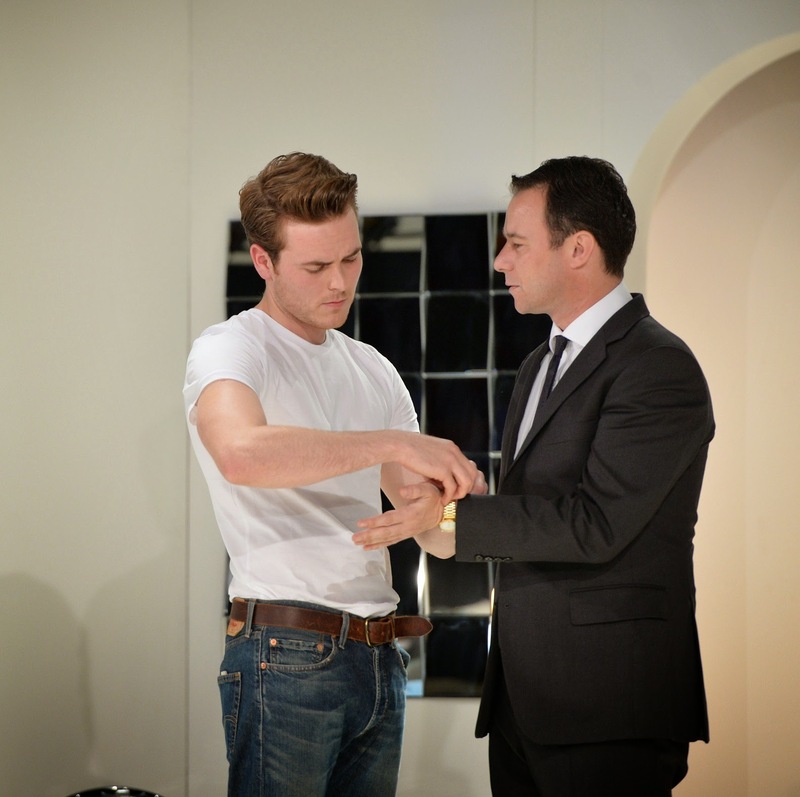 "EPSTEIN" OFFICIALLY OPENS IN LONDON’S WEST END! EPSTEIN OFFICIALLY OPENS IN LONDON’S WEST END! Epstein: The Man Who Made The Beatles - the long-awaited play about the legendary music manager Brian Epstein, opened at London’s Leicester Square Theatre on Monday night, with stars of stage and screen turning out for the press night performance. The show will run for six weeks until Sat 6th September. Celebrity guests at the opening included Frankie Goes to Hollywood singer Holly Johnson, record mogul Seymour Stein, Coronation Street actors Philip Lowrie, Gwen Taylor and Charlie Condou, musician and photographer Mike McCartney, Pink Floyd drummer Nick Mason, Merseybeat singer Beryl Marsden, Everton chairman and theatre producer Bill Kenwright, along with actress Jenny Seagrove, The Beatles’ booking officer Joe Flannery and Merseyside MP’s Angela and Maria Eagle to name but a few. Stars of the show Andrew Lancel and Will Finlason received a standing ovation for their portrayal of Brian Epstein and fictional character ‘This Boy’; both returning to the roles after the show premiered in Liverpool in 2012 as part of the city’s official Beatles 50th Anniversary celebrations at the city’s Epstein Theatre. The show opens hot off the heels of The Beatles 50th Anniversary celebrations happening around the world, Brian Epstein posthumously inducted into the Rock & Roll Hall of Fame and also the unveiling of a commemorative blue plaque at the London offices of Epstein’s company NEMS on 29th June. Brian would have celebrated his 80th birthday this September. Epstein: The Man Who Made The Beatles is the untold story and window into the private world of the gay, Jewish, music entrepreneur whose stellar career as Beatles Manager made him a household name yet whose controversial personal life remained very much in the closet. Brian died in 1967 of a concluded accidental overdose at the age of 32. This two-hander play imagines this brilliant but troubled man’s drug-fuelled final days whilst looking back upon his illustrious adult life and meteoric career from his drama school days to managing the world’s biggest pop group - a must-see opportunity to discover a previously unexplored story and celebrate a true icon of 1960’s popular culture – a man who shaped music and style across the world. Now running at London’s Leicester Square Theatre until 6 September 2014, Epstein: The Man Who Made The Beatles is brought to you by Bill Elms & Jen Heyes Productions Ltd, written by Andrew Sherlock and directed by Jen Heyes. More information on Epstein: The Man Who Made The Beatles can be found at www.epsteintheplay.com. Supported by Arts Council England, Orange Amplification, Liverpool Vision and Liverpool Echo. Production partners: The Beatles Story (Liverpool), Hard Day’s Night Hotel (Liverpool), Hard Rock Cafe (London), The Beatles Coffee Shop/Beatles Walks (London). Media Partners: Absolute 60’s Radio, Waterfront Magazine and Beatles Magazine. The official hotel partner is Radisson Blu Edwardian, London. The official production charity partner is CALM www.thecalmzone.net. See the Cheatles and Help a Good Cause. Visit Historic Woolton Baths During Beatle Week!